Cupid is coming, so let’s get a little creative this year. Want to make something for that secret admirer? Perhaps you want to surprise your significant other with a special treat for Valentine’s Day. Dosha Pops has you covered as we share this unique and tasty recipe that will be sure to jump-start those romantic feelings this holiday. This DIY easy herbal tea dessert is the perfect compliment to your VDay date including our yummy lollipops and candy countdown calendar. For the romantic holiday, we chose to create hibiscus tea and coconut milk multi-layered gelees based on their simplicity and elegance. Our favorite ingredient that makes this recipe super easy (which we all need in our busy schedules) is agar. It’s a white semi-translucent extract from red algae with no discernable flavor that we used to thicken the herbal tea and coconut milk to create these beautiful gelees. Rich in iodine and trace minerals, agar has been used for hundreds of years in Asian cooking. In India, it’s called China grass. Best of all it’s suitable for vegans and vegetarians. Steep 4 tea bags in boiled water for 15 minutes in a medium saucepan. Remove tea bags. Over medium heat, whisk in agave and agar powder until it dissolves. Boil for 15 minutes. Pour mixture into dessert dish. Allow to set and proceed with the second layer. Pour coconut milk, agave and agar powder in a medium saucepan. Cook over medium-low heat for 15 minutes. Whisk until agave and agar dissolves. Pour mixture into dessert dish. Allow to set. Sprinkle with pomegranate seeds (if this is your top layer). Note: We made each layer one at a time because each layer has to set before it can be topped with another layer of liquid. If a layer doesn’t set correctly, re-cook the problematic layer. Repeat this recipe to make multiple layers. We wanted to create a Valentine’s celebration that lasts longer than one day to show our loved ones how much they mean to us. An easy way to do this is to create a candy calendar, similar to a Christmas Advent calendar. 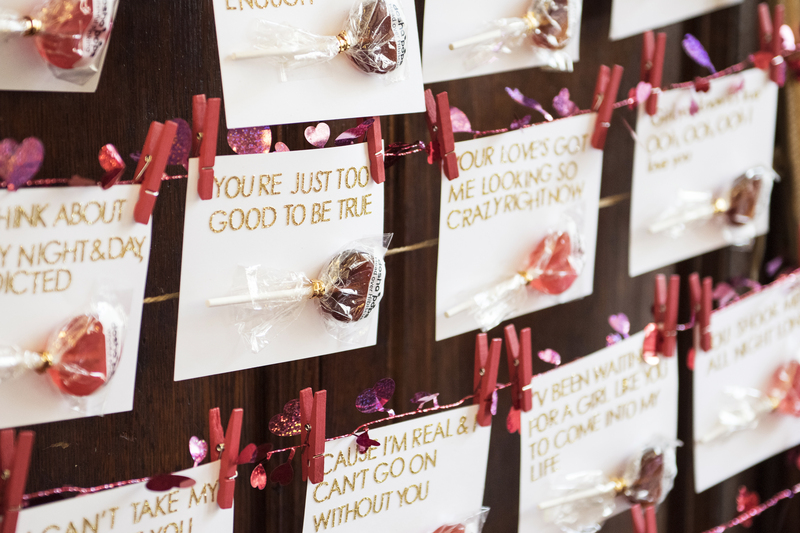 Adding a modern twist on a classic, we combined our love of music with candy to created a 14 day lyrical love note candy countdown. Each card has love song lyrics on the front with an attached Dosha Pop and the name of the artist on the back. The love notes are placed in envelopes and tied to a picture frame to create a picture perfect display. Card recipients will be surprised when they open the cards with familiar love song lyrics. If they don’t know the song of the day, they can see the artist on the back of the card. Once you’ve chosen the love songs, use the adhesive letters on the front of the blank cards to spell out the lyrics and the back for the music artist’s name. Press the stamp on the ink pad then press the stamp on the back of the card, under the artist name, to create fun graphics. We made hot pink and red lips. Next, secure a dosha pop to each card by using glue dots. Place an adhesive number on each envelope for how many days you want to countdown. Put the cards in the glassine numbered envelopes. Measure the wire across the frame. Use the scissors to cut the measured pieces of wire. Secure the wire across the picture frame by wrapping it around the frame or taping it to the back of the frame. Secure the cards with mini clothespins in numeric order onto the wires. Now your countdown calendar is complete! On Valentine’s Day, you can sweeten the already perfect day by giving that special person their last lyrical love note and the gelee desserts. Bonus points if you create a playlist of songs based on the lyrical love notes. We’ll be handing out our lyrical love notes to friends who gave us a great list of their favorite love songs, which was the really fun part of this project! Make sure to share yours with us. Upload them to Instagram and make sure to tag #DoshaPops in them.